“You don’t go to Cuba to eat,” just about everybody had warned me. “There’s nothing to eat… NOTHING!” admonished my friend Ruth, who leads food and market tours in Mexico City. Well, it turns out it’s not true. 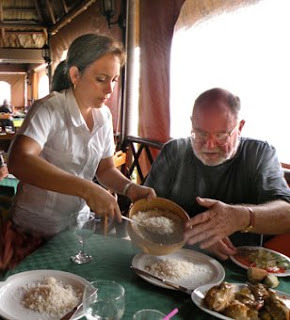 I’d been to Cuba once, ten years ago, and my culinary memories were dim. As a food writer and restaurant critic, my recent return trip was an eye (and heart) opening experience. Havana is the most beautiful city in Latin-America, essentially untouched since the revolution of 1959. Its architecture was spared the dreadful disregard that builders of the late 20th century had for their fellow human beings. None of the horrendous mirrored behemoths of Mexico City leer mockingly at a cowering populace. Architectural gems abound in a dozen different styles, including Spanish colonial, elegant neo-classic, art deco, and Vegas-style 1950’s streamline. Some buildings are being renovated by foreign (mainly Spanish) investors, others are left to their slow disintegration. 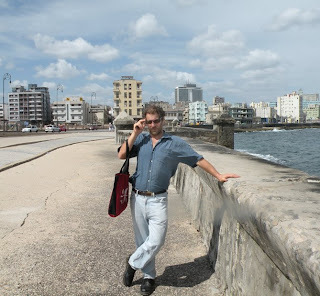 Havana’s sights and sounds are compelling. Classic cars are still around (some available as taxis), and hip-swaying music is heard everywhere. While superficially time seems to have stood still, this is just one aspect of this vibrant swinging metropolis. Cuba’s people live very much in the present—how else to endure the hardship daily life presents here? I knew Cuban food from my early days in New York. My mother and I hung out at Victor’s Café on the upper West side, a haven for ex-pat Cubans and their fans. Aromas of garlic soup, roasted red peppers, spicy picadillo, flaky empanadas, fruity batidos and luscious baked flan were some of my earliest and most pleasurable foreign food memories. Cuban cuisine is a fusion of Spanish, African and Caribbean influences. Additions from a small Chinese community are found in certain dishes as well. Cooking is based on starchy tubers such as yucca, malanga, potato, and plantain, and the ubiquitous rice with black beans (when mixed together called moros y cristianos). Sauces are simple: a sofrito of onion garlic and tomato is the flavor base of many Cuban dishes. The spices most discernable are cumin and cinnamon, and condiments are achiote (annato), and bitter or Seville orange. Hot chilies are rarely used. Workers in Cuba earn the equivalent of about US $15 per month in Cuban pesos. With these, they are given libretas (ration books), allowing them small amounts of basic food stuffs such as rice, oil, sugar and flour. Other relatively inexpensive foods can be bought with one’s remaining pesos: beans, fruits, vegetables, and meat (limited to pork or mutton of low quality). ‘Luxury’ items include chicken, fish, seafood, beef, alcohol, olive oil, and cheese. These must be paid for with the CUCs (convertible pesos), which in 2004 replaced the dollar as the currency used by all tourists or locals to buy luxuries. 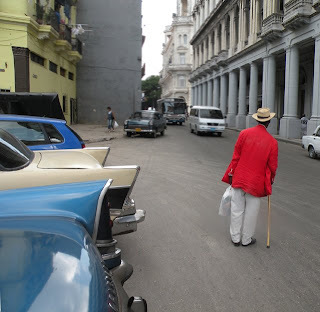 When I asked a Cuban acquaintance why there are still two currencies he shrugged, responding with resignation, “That’s what everybody asks—it’s just the way it is.” CUC’s are only earned by people in government jobs or in the informal economy – those serving foreigners, or with family members abroad. Even a bottle of spring water at the bus station was priced $1.20 (CUC) and was not for sale in Cuban pesos. In effect, most people can’t have these things. The majority never eat a whole chicken or a plate of shrimp or lobster. Despite warnings about the old Soviet plane I would be herded onto, I chose Aviación de Cubana for its reasonable price, nonstop flight and good hours. My two hour flight from Mexico City was uneventful and comfortable. My hotel choice was a jackpot. 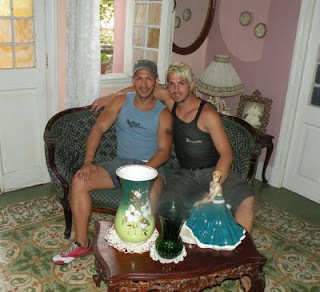 ‘Ray’s Casa Particular’ is a vintage 1920’s apartment with three guest rooms and two shared baths near Habana Vieja. It is filled from floor to ceiling with kitchy-campy knick-knacks, is gay-friendly (although open to everyone) and more than comfortable. At US $25 including a good breakfast, it is a bargain. After unpacking my bag, I set out on my eating expedition. My first stop was lunch at El Aljibe. This airy outdoor restaurant is located in the “nice” section of town called Miramar, a short ride from the center. I had the pollo asado Aljibe, a roasted bird served with a lightly thickened sour orange sauce. It was served with white rice and the best black beans in the world: thick and creamy while retaining their texture, fragrant with cumin, a touch of vinegar adding a tart undertone. Restaurants here are not as cheap as you might think, but this is one of Havana’s bargains, approximately $12 US for all you can eat. Also excellent here are the classic arroz con pollo, served in a clay cazuela and spicy, aromatic picadillo. In 1995 the government initiated a program to allow paladares (privately owned small restaurants) to operate. Paladar is Spanish for palate or taste. People opened their dining rooms to the public, offering simple home cooked food. Some have blossomed into full fledged professional operations, others retain their home-kitchen ambience. La Guarida calls itself a paladar but is really a restaurant, with printed menus, bow-tied waiters, and even a wine list. It’s located in an old, unmarked apartment building made famous by the 1994 film Fresa y Chocolate which was filmed there. The dining rooms of this converted apartment are reached by climbing three flights of run-down, poorly lit stairs. Old mosaic patterned floors, ornate antique wooden furniture, and peeling yellowed walls ooze ambience of an elegant past. The crowd is international. We were seated near a group of embarrassingly loud American business types – what were they doing here, I wondered, as there is no American business in Cuba. The food here was more adventurous and varied than anywhere else we ate. I started with eggplant ‘caviar’, the roasted vegetable well seasoned and attractively presented. I enjoyed my swordfish with seafood in a light cream sauce. It was fresh and well balanced although it arrived tepid. The pork medallions in mango sauce were juicy and tangy/sweet. There’s a choice of Spanish and Chilean wines, reasonably priced at around $20 US. Service is not up to international standards in Cuba and here was no exception – you have to work hard to get what you order. I finished the meal well fed but curious--how is a private enterprise like this allowed to flourish in communist Cuba? “They have friends in high places”, a Cuban friend speculated. At Paladar Gringo Viejo we enjoyed one of the best meals of all. It is located in the Vedado area, once home to Havana’s elite and now a laid back residential neighborhood dotted with apartments, hotels and restaurants. A simple space features a poster of the star of the eponymous movie, Gregory Peck. The garbanzo beans, flavored with ham, tomato, green peppers and onion was a hearty appetizer. Baked lamb shanks, braised with tomatoes, peppers and cumin were gigantic, tender and succulent. This is Criollo (Cuban home) cooking at its best. 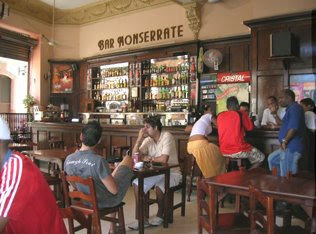 Los Nardos is a well known centro venue, attracting políticos and well-heeled Cubans. Copious Criollo specialties are the order of the day here–we saw many people leaving with ‘doggy bags’ of leftovers. I was happy to encounter escabeche, a dish I recalled from New York. A firm white fish is sautéed then marinated in white vinegar, onions, pepper and oregano and served at room temperature— perfect for tropical weather. The roast chicken was falling-off-the-bone tender. Cristianos y moros were satisfying as always, and plates were huge, as promised. A side of tamal Cubano turned out to be whipped up fresh corn, jazzed with a hint of garlic and tomato. It was pleasant, but baby food-like. Be sure to request a table in the front rooms as the rear is dreary. A trip to a large covered market in Havana’s Vedado neighborhood was a real eye-opener. I was immediately grabbed by a skinny but strong-willed lady who insisted on giving me a “tour” of the market. To label her aggressive would be polite. “Look at this!” “Photograph him--no not him, HIM!” she shrieked. I obediently did as I was commanded. 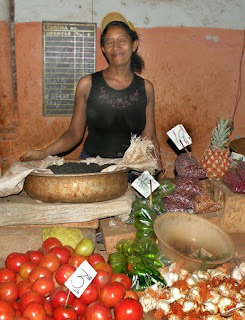 There was quite a variety of produce in this market, where only Cuban pesos could be spent. For sale were fresh lettuces and leafy greens, green beans, peas, squash, tomatoes, several kinds of potatoes and tubers like malanga and yucca, carrots, pineapple, mango and papaya. Although the meat section was limited to some fatty pork and bacon and gristly looking mutton, there were long lines to buy. In a large bodega, rationed staples such as flour, sugar, rice, oil and vinegar were doled out. The market was bustling, the atmosphere jolly. Foods were of high quality and looked fresh, but the choice was narrow compared to a similar sized Mexican market. My “guide” had bought a bag of malanga tubers for her family’s dinner. Perhaps with the tip I gave her she would buy a little bacon to liven it up. The “24 hour” store around the corner from my guest house seems to be the happening place at 1 AM, at least to hang out and chat. That’s because they have almost nothing to sell. All of about two dozen products laze about the roomy shelves. I was able to locate a dusty box of crackers to take up to my room, but I’m afraid there is not another one left for the next hungry traveler. Street food in Cuba is limited to the famous peanut vendors and purveyors of small sandwiches containing a slice of mystery meat and a lettuce leaf. I saw signs and photos of mouth watering tortas de lechón (sandwiches of suckling pig), but the pig itself seemed not to exist. I remember the wonderful, colorful “batidos” at Victor’s in New York – thick, refreshing fruit milk shakes with exotic names like mamey and guayaba. I didn’t see any on offer in Cuba. I didn’t find a gourmet’s paradise in Cuba. But I ate well and abundantly, and the whole experience made me feel happy and very alive. When I thought of what most people on the island were eating, I toned down my critical agenda and enjoyed my food, thanking God for the abundance in my life, and the freedom to move and think that I often take for granted. The spirit of ingenious creativity that prevails in Cuba is positively intoxicating—I’m already planning my next trip. Note: for more tips see my other post: I'll See You in C.U.B.A. 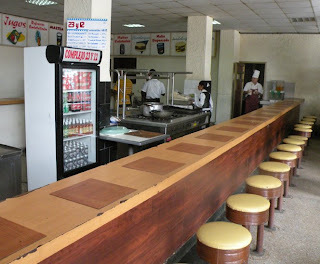 When I was in La Habana a few years ago, I found la Guarida like an oasis in a culinary desert. I wish I had read your blog then before going as there are clearly other good places to eat. After a week in Cuba with my son I wanted to return to Mexico, especially as we went in hot humid August. I did not like the food in general, the lack of produce in the shops and markets, the street hassling and the sense of two systems almost like apartheid - one for the tourists and one for the locals. My son, though, persuaded me to stay for the three weeks we had planned and I ended up really liking it. We went to some interesting places like the island of La Juventud. We also found someone who cooked for us in Habana Vieja in their house which was great. A lot of delicious foods that hotel can cater and serve.